with various stakeholders in a local area to meet the objectives of the U.S. government. 95th Civil Affairs Brigade teams work with U.S. Department of State country teams, government and nongovernmental organizations at all levels and with local populations in peaceful, contingency and hostile environments. population centers around the world. They help host nations assess the needs of an area, bring together local and non-local resources to ensure long-term stability, and ultimately degrade and defeat violent extremist organizations and their ideologies. They may be involved in disaster prevention, management, and recovery, and with human and civil infrastructure assistance programs. months or years in remote areas of a host nation. Their low profile and command structure allow them to solidify key relationships and processes, to address root causes of instability that adversely affect the strategic interests of the United States. Originally constituted in Aug. 1945 as the 95th Headquarters and Headquarters Detachment, Military Government Group, the first iteration of the 95th Civil Affairs Brigade helped Japan transition from a wartime to a peacetime society, before the Detachment was inactivated in Kurume, Japan in June 1946. Reactivated in Oct. 1948 as the 95th Military Government Group at Fort Bragg, N.C., the 95th served during the Korean War before it was again inactivated in Pusan, Korea in Oct. 1951. After its allotment to the Regular Army in 1954, the 95th Civil Affairs Group, based at Camp Gordon, Ga., assisted in setting up a refugee center at Camp Kilmer, N.J., after the 1956 Hungarian Revolt. It also supported the 82nd Airborne Division in the Dominican Republic in 1965. In July 1971, the 95th Civil Affairs Group re-turned to Fort Bragg and was assigned to the John F. Kennedy Center for Military Assistance (CMA) until the Group's inactivation in June 1974. When al-Qaida terrorists attacked the United States on Sept. 11, 2001, the Army's only active-duty Civil Affairs force consisted of the 96th Civil Affairs Battalion which was comprised of 206 Soldiers, with regionally aligned companies. 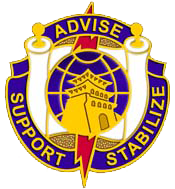 Accelerated growth to support our Nation’s needs led to the active CA force to be redesignated as a brigade in March 2006, the 95th Civil Affairs Brigade was activated the following year on March 16, 2007, with the nucleus being the soldiers from the 96th Civil Affairs Battalion. Today, the 95th Civil Affairs Brigade provides Civil Affairs Soldiers to support Department of Defense Special Operations Command task forces and the five U.S. geographic combatant commands. As of Nov. 2012, the 95th Civil Affairs Brigade consists of more than 1,200 Soldiers, including five battalions: the 91st, 92nd, 96th, 97th and 98th Civil Affairs Battalions. The brigade is in the process of growing from about 1,200 Soldiers to more than 1,800 Soldiers by 2017.